Sunday Surprise: Dolls Bearing Gifts! When I was a little kid--maybe six or seven years old-- I had a good friend who really liked mice. She and I would pretend that we actually were mice, and we'd play through imaginary scenarios where evil cats (our older sisters) were chasing us or we had to go on an epic journey to find cheese (chocolate). We had a lot of fun together. One year, this friend came for a sleepover at my house the week before Christmas. My family had all of our Christmas decorations out, including a cute little mini tree that came with colorful lights attached to the branches. My friend thought that this was a perfect mouse-sized tree--and it was. We became obsessed with the tree and played with it all afternoon. As our game developed, we began to convince ourselves that mice had their own version of Christmas...which just happened to be the next day. This idea was beyond thrilling. By evening, we were dancing around the mini tree, chanting little songs and declaring that it was Mouse Christmas Eve: the night Santa Mouse would come bearing gifts for all of the well-behaved mouse children. We were so excited, and we were so sure that Santa Mouse would come. The thing is, Santa Mouse did come that night. When my friend and I woke up the next morning and rushed into the living room to look at the tree, there were a handful of miniature wrapped presents underneath! We were beside ourselves. Each of the tiny packages had an even tinier gift inside--perfect for a pair of mouse friends. To this day, I still have no idea how my parents pulled off Santa Mouse's late night, last-minute visit. What I do know is that the wonder of that morning gave me an enduring respect for the magic of Christmas--and a passion for tiny presents. Every time I see a small package that might contain a mystery gift, I remember my childhood friend and our Santa Mouse. 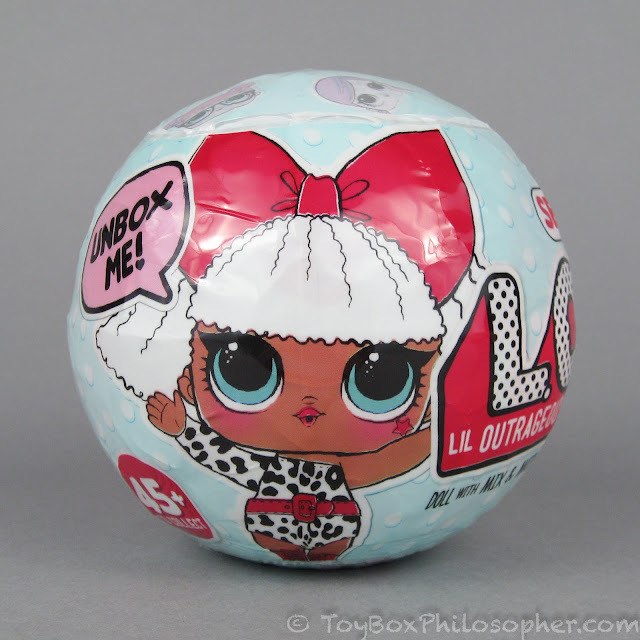 In today's post, I'll de-box a couple of dolls (mostly Barbies) that come with little gift boxes. Some of these gift boxes might have a secret present inside...some might be empty props. But never fear! If any of the boxes yield disappointment, Santa Mouse will come to the rescue and make sure there's a good surprise for all of you to see. 2000 Holiday Surprise Barbie (with gift). It's become a bit of a yearly tradition for me to make the toy store rounds just before Thanksgiving. I always like to see what's out there for the holiday shopping crowds, and this year I was also trying to find a Hatchimal. I did not find a Hatchimal (no surprise), but I did have a fun time looking through the impressively well-stocked South Portland Toys R Us. I've never seen this particular store so full of toys. I had a great time wandering through all of the aisles, looking at the dolls and eavesdropping on earnest conversations and negotiations between little kids and their parents. So sweet. I also enjoyed seeing the new American Girl display, which takes up half of the front of the store now (and has displaced the Journey Girls completely). I got to see all of the WellieWishers characters and admire the ocean-loving Camille in person (her hair looks great!). It was a wonderful, indulgent morning. Shibajuku Girl "Yoko" by Hunter Products, $29.99. Sunday Surprise: Lil Outrageous Littles (L.O.L.) 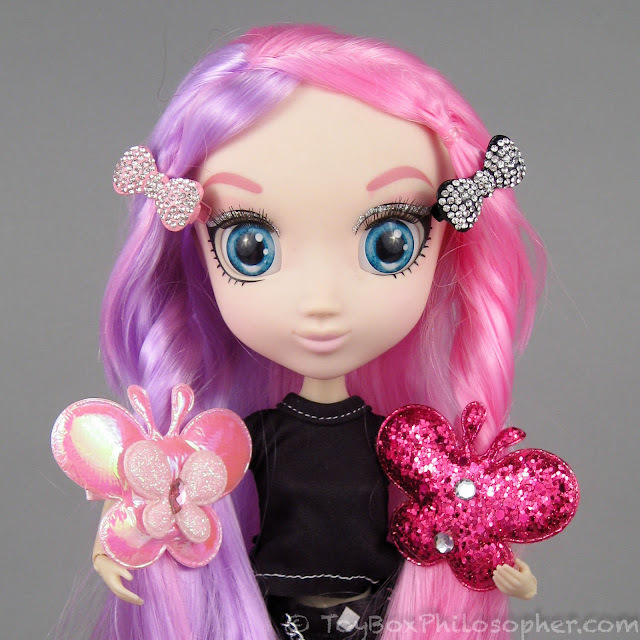 Dolls! I should never be allowed to do more than one thing at a time. This past week, I've been working on two reviews--one of them a Sunday Surprise, one a regular review. But I kept bouncing back and forth between the two posts, not staying focused enough to finish either one of them. Sigh. And now it's Sunday. And what was my solution to this problem, you might ask? Start a completely different Sunday Surprise review, of course! Why not? Lil Outrageous Littles (L.O.L.) doll by MGA Entertainment, $7.99. Sunday Surprise: Mommy-to-be Judith Dolls! I realized yesterday that there are only two Sundays left until Christmas. Two. Can you believe that? It took me totally by surprise. It's much more typical that I'm waiting and waiting for Christmas, moping around the house because I feel like the big day will never come. Things seem to be happening faster than usual this year for some reason. Anyway, this realization threw me into a panic because I have a bunch of different Sunday Surprise toys that I wanted to chat about before the holidays, and now I can only look at two of them! Today I want to show you something called the Mommy-to-be Judith doll. This doll was developed in Europe (I think?) and introduced into the United States in 1991 (back when I was a kid). There's not much information about these dolls on the internet, but there's a Chicago Tribune article from 1992 that's been archived online. This article states that Judith is believed to be the first pregnant play doll distributed in the United States. That's pretty cool! Of course Mattel came along a decade later with their pregnant Midge doll, but the Judith Corporation was apparently first on the scene. So why is Judith a good doll for the Sunday Surprise? Well, because the gender and appearance of her little baby is a mystery! And, what makes this doll unusually fun is that the company put boy babies in half of their dolls and girls in the other half (according to the Tribune article). So I have an actual 50:50 chance of getting a little boy today! Better yet, I'm going to de-box two Judith dolls, and while this won't change the odds of either baby being a boy...at least I have two chances. My youngest son and I are on the road for a few days, driving all over the Northeast. We spend a lot of time in each other's company at home, but we tend to stick to our routines. We're hard-core homebodies and creatures of habit, he and I. So, this trip is unusual for both of us, but it's so much fun! I love road trips: chatting, listening to podcasts, eating too much food. The only downside is that hotel-hopping leaves little time for blogging, and I've been really eager to show you my progress on the Saskia Project. At the moment, my son is catching up on some homework, so it's the perfect chance to give you the scoop! For anyone who stumbled on this post but isn't familiar with the Saskia Project, I'll give a quick recap: my idea for this project was to purchase and complete a reborn doll kit--something I've never done before. 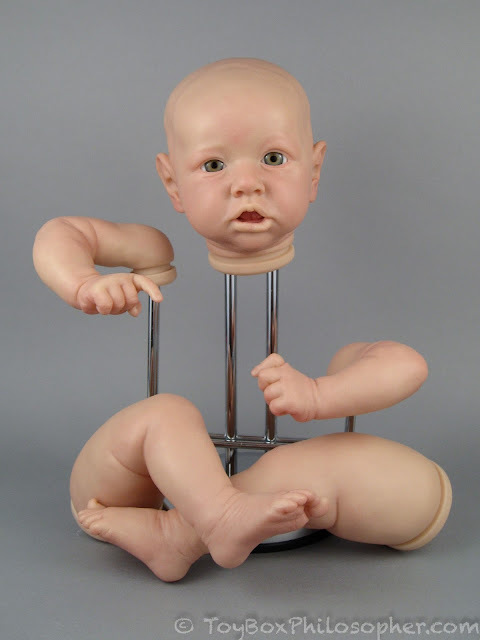 These kits are popular (and can be expensive) and they only include the basic components necessary for making a baby doll. For example, my kit included unpainted vinyl limbs, an unpainted and eyeless vinyl head, and an un-stuffed cloth body. To successfully complete a reborn kit, a large investment of time and additional materials is necessary. I was curious about how accessible (and expensive) this whole process would be for someone with very little experience. The Saskia kit by Bonnie Brown (partially completed).